Master-Drummer David Jones is presenting a new concert at the Salon, Melbourne Recital Centre, and the numbers 10 – 5 – 2 – 1 sum it up. 10 musicians, 5 CDs, 2 concerts, 1 night. 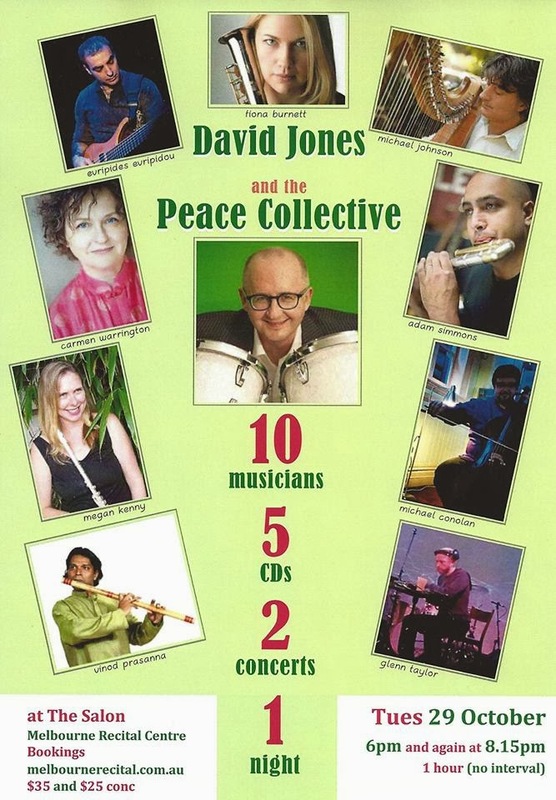 The style of music played by the Peace Collective is not easily defined, so David has come up with a new phrase – FAB Music. FAB stands for Free Ambient Beauty. In the last few months, members of the Peace Collective have recorded together on a number of projects, resulting in the release of 5 new CDs. “This concert is a celebration of an extraordinarily creative period for us all” says David. “We’ll present snapshots of each of the CDs, and then conclude with a 10-piece improvisation and that’s going to be amazing” he enthuses. EVENT: Tuesday 29 October, 6pm and again at 8.15pm at The Salon, Melbourne Recital Centre.